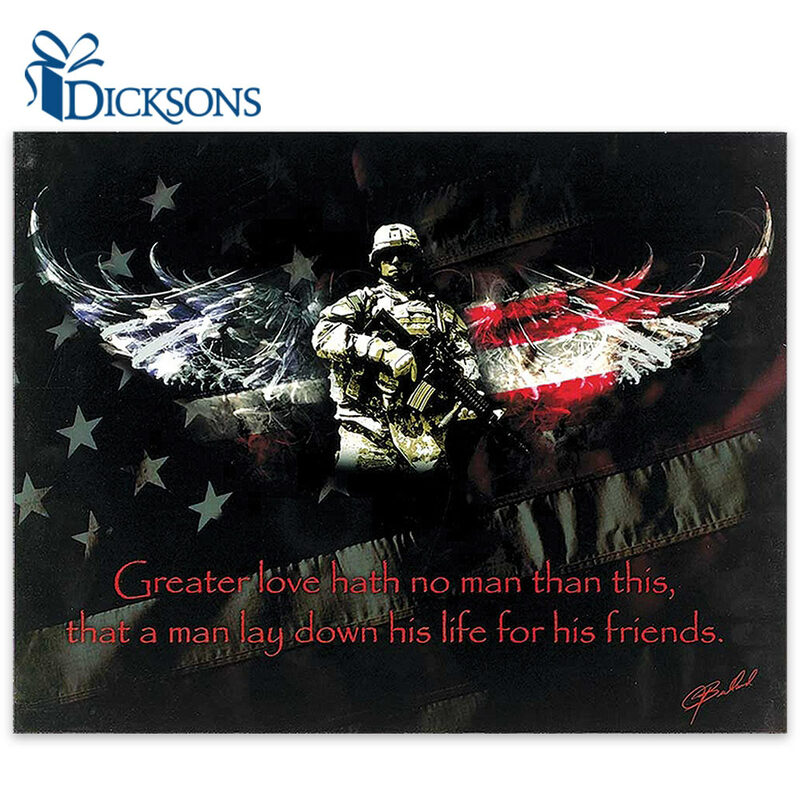 Greater Love Hath No Man Than This... - Wooden US Military Tribute Sign | BUDK.com - Knives & Swords At The Lowest Prices! Exquisitely designed and movingly poignant, this handsome wooden sign livens any space in your home or office with vibrant color and unique imagery. Best of all, it's a great way to show your appreciation for America's Armed Forces - the brave men and women who risk their lives defending our freedom. The eye-catching placard depicts a uniformed soldier front and center, flanked by brilliant rays of red, white and blue light artfully arranged to mimic angel wings. An American flag soars in the background, and the touching, undeniably fitting words of John 15:13 are emblazoned below the soldier, who grips an assault rifle and gazes forward with an expression of determined resolve. "Greater love hath no man than this, that a man lay down his life for his friends," the sign reads. At 18" long x 14" high x 3/4" thick, this versatile decor piece is ideally sized and perfectly suited to any setting. It melds seamlessly into a traditional interior design scheme and even smartly offsets quirky modern and postmodern decor with a touch of poignant grace. Mount it above your fireplace or mantle as a lovely living room centerpiece. Add vivid color and light to your kitchen or dining area by hanging it on the wall beside the family dining table. Place it in a vintage wrought iron rack and set it atop a dresser or even an office conference table as a stylish perpetual reminder of how blessed you are to enjoy the freedoms valiantly won and defended by American servicemen and servicewomen. There's really no wrong place for this striking tribute sign, and with its timeless message and moving design, rest assured it will never go out of fashion. Get two - one for yourself and one to give to a soldier, airman, sailor, marine or other service member in your life. Or gift it to loved ones of a "fallen angel" - a soldier killed in the line of duty. It's a heartfelt homage sure to be appreciated and remembered for years to come. This Tribute Is whats it all about ! Nicely mounted on wooden board.